Botkins’ Spencer Heuker shoots during a nonconference game on Friday at the Coliseum. Heuker led the Trojans with 24 points. Botkins' Tyler Free shoots during a nonconference game on Friday at the Coliseum. Botkins’ Zane Paul shoots during a nonconference game on Friday at the Coliseum. Paul scored 22 points. Botkins' Spencer Heuker drives with pressure from Ridgemont's Connor Martina during a nonconference game on Friday at the Coliseum. Botkins' Jayden Priddy drives past Ridgemont's Landon Newland during a nonconference game on Friday at the Coliseum. Botkins' Zane Paul shoots during a nonconference game on Friday at the Coliseum. 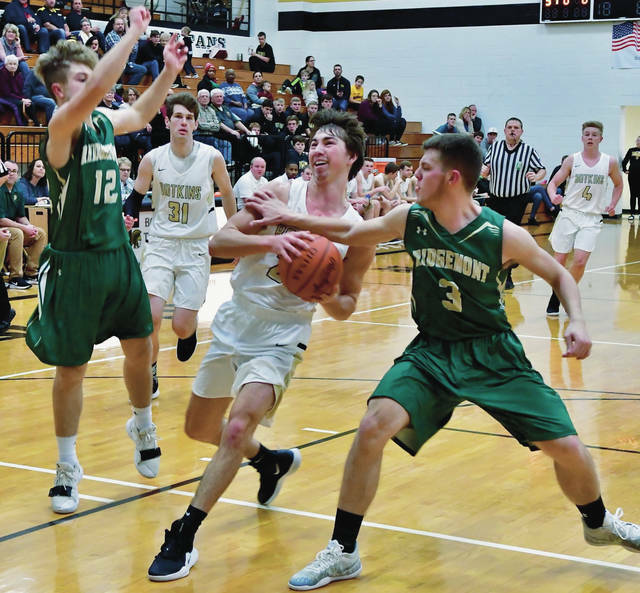 RUSSIA — Fort Loramie continued two hot streaks in a Shelby County Athletic League game at Russia on Friday. The Redskins picked up their fifth consecutive victory and earned their sixth straight victory in matchups against the Raiders with a 54-48 win. Russia jumped out early. 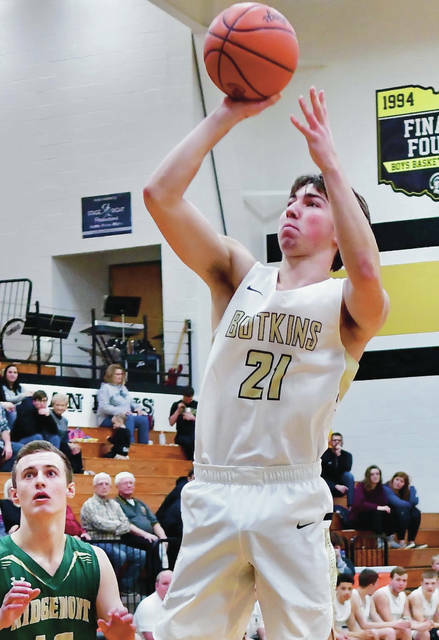 Jordan York made a fade away jumper at the buzzer gave the Raiders a 10-5 lead after the first quarter, but the Redskins drilled five second quarter 3-pointers (including two from Jake Ratermann) to help mount a 19-7 run. The Raiders scored the final four points of the half to cut the gap to 24-21 at halftime. Fort Loramie withstood multiple Russia runs in the second half without ever relinquishing the lead. The Raiders cut it to one at 40-39 with under three minutes to play, but Ratermann connected on a huge 3 from the deep corner and help keep the Raiders at bay. The Redskins had balanced scoring with nine players making baskets. Nathan Raterman led the way with 10 points while Jake Ratermann had nine. Eli Rosengarten and Mason Kemper each scored eight. Mason Dapore led Russia with 17 points while Jordan York scored 13. It was the second time in 10 days the squad had played. The Redskins won 60-58 in double overtime on Jan. 8. 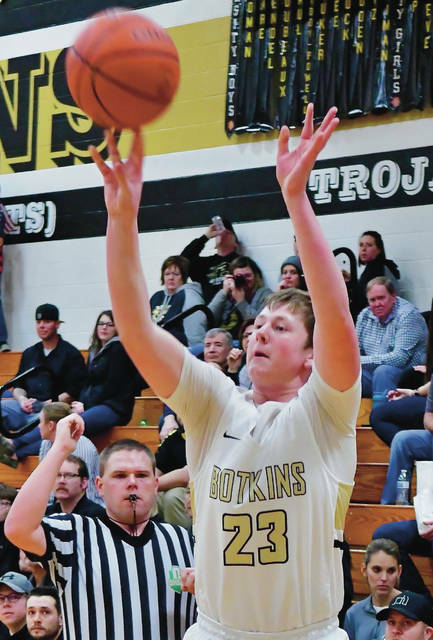 Botkins took a nine-point lead by the end of the first quarter and gradually pulled away from there in a nonconference win over Ridgemont on Friday at the Coliseum. The Trojans led 24-15, 45-34 and 67-50 at the quarter breaks. Spencer Heuker led Botkins with 24 points while Zane Paul scored 22, Jaydon Wendel scored 16 and Tyler Free scored 12. Anna didn’t have much problem keeping its perfect SCAL record intact on Friday. After taking a 20-12 lead by the end of the first quarter, the Rockets used a 37-10 scoring advantage in the second to build a 57-24 halftime lead. 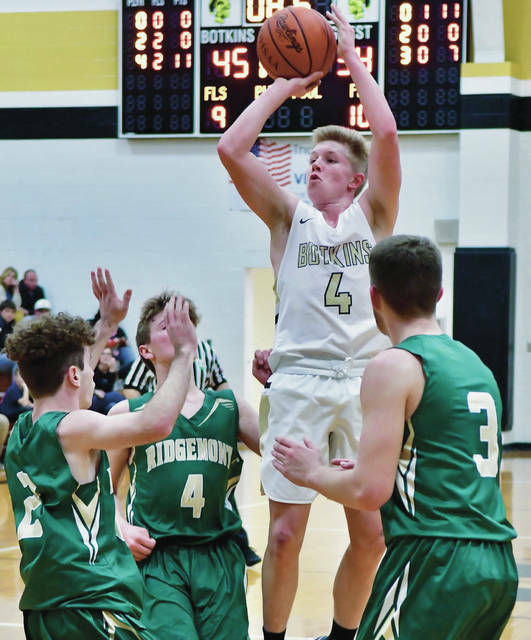 Bart Bixler led the Rockets with 24 points, 14 of which came in the second quarter. Griffin Doseck scored 13, Kamren Steward added 12, Riley Huelskamp scored 11 and Carter Elliott scored 10. Skyler Piper led Fairlawn with 12 points while Isaac Ambos added 10. Jackson Center jumped out to a 16-9 lead by the end of the first quarter and cruised from there in a road SCAL game on Friday. The Tigers used a 16-8 scoring advantage in the second to take a 32-17 halftime lead and led 42-31 heading into the fourth quarter. Aidan Reichert led the Jackson Center with 19 points while Trent Platfoot added 13. John Leist led Houston with nine points. Minster beat Marion Local on the road on Friday in a Midwest Athletic Conference game to stay tied atop the league standings. The Flyers led 13-10 at the end of the first quarter but Minster used a 13-8 scoring advantage in the second to take a 23-21 halftime lead. The Flyers tied it 30-30 heading into the fourth quarter, but Minster finished with a 15-12 scoring advantage to earn the win. Mike Ketner led Minster with 22 points and had a team-high six rebounds. The Wildcats shot 17 for 35 (48.6 percent) from the field while Marion Local shot 14 for 50 (28 percent). Marion Local had a 21-19 rebound advantage. Bryce Blickle hit the game-winning shot at the buzzer to give New Bremen a home MAC win on Friday. The Panthers had a 21-14 lead at the end of the first quarter but New Bremen pulled within 28-27 by halftime. The Cardinals took a 42-39 lead into the fourth quarter before Parkway tied it up late. Blickle led New Bremen with 17 points while Patrick Wells scored 12. The Tigers led for much of a MAC contest on Friday but the Redskins used an 18-12 scoring advantage in the fourth quarter to rally. St. Henry led 18-14 at the end of the first quarter but Versailles led 34-31 at halftime and 47-44 heading into the fourth. Evan Hiestand led Versailles with 19 points while Connor VanSkyock scored 12 and Michael Stammen added 11. Brody Bowman scored seven points in overtime to cap off a massive game and help Temple Christian beat Riverside in a Northwest Central Conference contest on Friday in De Graff. The squads were tied 14-14 at the end of the first quarter and Temple Christian led 29-26 at halftime. The Pirates used a 13-12 scoring advantage in the third and 14-12 advantage in the fourth to force overtime with a 53-53 score. Lane Willoby led Riverside with 28 points while Kameron Schlumbohm scored 11. The Pirates shot 24 for 61 (39.3 percent) from the field and owned a 38-28 rebounding advantage. The Yellow Jackets’ bowling squads split a match with Vandalia-Butler at Bel-Mar Lanes on Friday. Sidney’s boys squad defeated Butler 2,332-2,276 to improve to 9-3 overall and 6-3 in Greater Western Ohio Conference American North Division play. Jaxon Rickey had a 429 series, Harrison Fisher had a 389 series and Logan Finke had a 384 series. The girls squad lost to Butler 1,716-1,502 and dropped to 3-9 and 2-7. Sarah Bell had a 285 series and Camryn Smith had a 273 series. Botkins’ Tyler Free shoots during a nonconference game on Friday at the Coliseum. Botkins’ Spencer Heuker drives with pressure from Ridgemont’s Connor Martina during a nonconference game on Friday at the Coliseum. 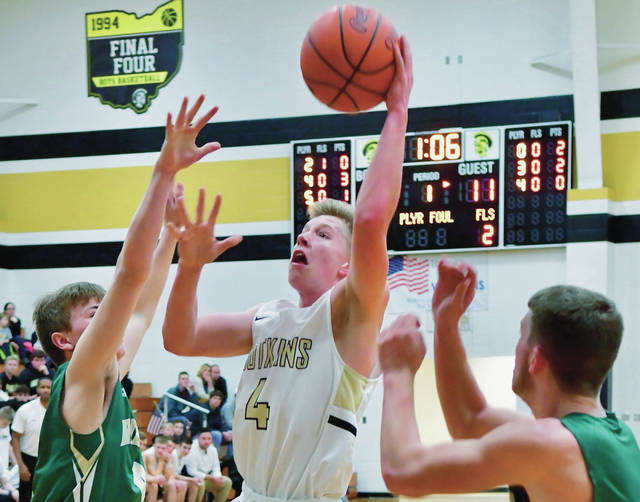 https://www.sidneydailynews.com/wp-content/uploads/sites/47/2019/01/web1_DSC_7680-7.jpgBotkins’ Spencer Heuker drives with pressure from Ridgemont’s Connor Martina during a nonconference game on Friday at the Coliseum. Botkins’ Jayden Priddy drives past Ridgemont’s Landon Newland during a nonconference game on Friday at the Coliseum. Botkins’ Zane Paul shoots during a nonconference game on Friday at the Coliseum. 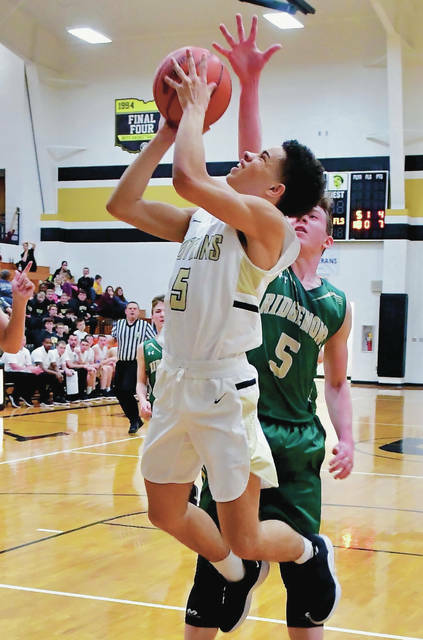 Coaches can report results for Sidney Daily News’ daily roundups by sending scores, statistics and comments as soon as possible after games to sidneysports@aimmediamidwest.com.